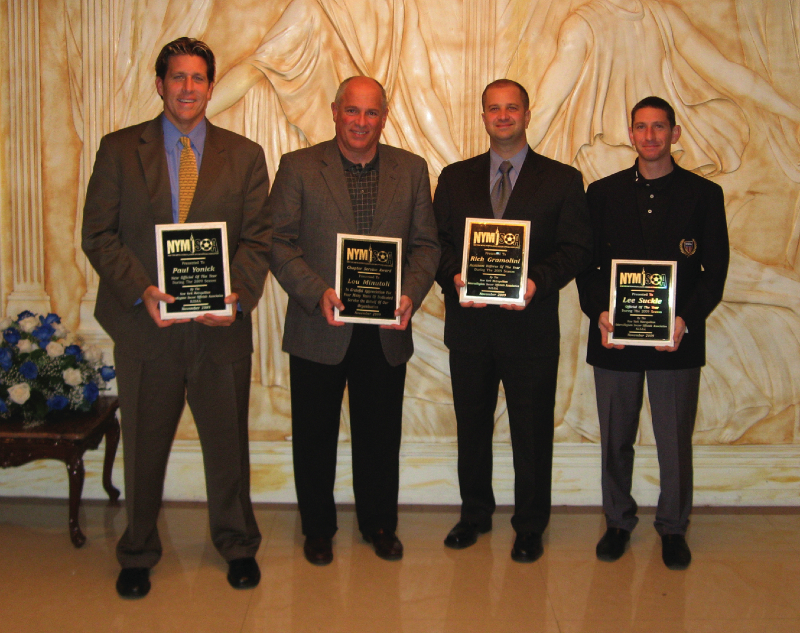 Since 1964, the New York Metro Intercollegiate Soccer Officials Association (NYMISOA) has been providing the officials for college and junior college games in New York City, Long Island and Westchester County. 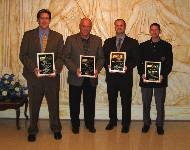 This year’s four referee award winners were honored at the NYMISOA Dinner on November 16, 2009 at The Sterling in Bethpage. The awards were selected by balloting from the general membership. Lou Minutoli received the NYMISOA Service Award. Lou has served on the NYMISOA Board of Directors for nearly a decade and also schedules referees as the assignor for the vast number of ECAC (Eastern College Athletic Conference) games in the New York City metro area. “Lou has done an excellent job and handles his challenging role as an assignor with grace,” commented NYMISOA Executive Vice President Steve Lewin. Paul Yonick, in his second year in the chapter, was voted as the NYMISOA New Official of the Year. Rich Gramolini, also in just his second year in the chapter, was selected by his peers as the NYMISOA Assistant Referee of the Year. The Official of the Year is not a fireman but his “real job” is in the elevator business. Lee Suckle was selected as the top official. “You look forward to officiating with Lee. He is immaculately prepared for each game and does a wonderful job,” commented NYMISOA President John Puglisi. This entry was posted on Thursday, November 19th, 2009 at 9:32 am and is filed under General with keyword(s) member. You can follow any comments to this entry through the RSS 2.0 feed. Both comments and pings are currently closed.